We are a leading Manufacturer of waste water evaporator from Yamunanagar, India. Cloud Tech Waste Water Evaporator accelerate this natural process to provide optimal conditions by mechanical enhancement, both by means of the atomisation of water particles into fine molecules through mechanical interference and the propulsion of the water droplets high into the atmosphere to achieve hang time and the direct confluence of dry atmospheric conditions with suspended fine water molecules achieving world-leading evaporation efficiencies. Our wastewater evaporators are designed to use high volume air input that allows the water to be vaporized into the atmosphere at a high velocity while continually replenishing the evaporation field with low humidity ambient air. This Water Evaporation System uses large orifice spiral vaporizing technology for low maintenance and non-fouling operation. With a 1:2000 air to water ratio, Cloud Tech’s wastewater evaporators create the perfect conditions for optimal “Flash Evaporation” and are effective even in high humid conditions. Cloud Tech’ Fog cannon is inexpensive to operate, lightweight and compact, movable with off-road wheels, the system can be set up in a few hours, quickly providing a safer, more comfortable environment while reducing labor costs. 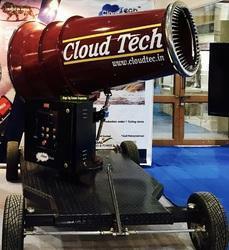 The Cloud Tech Fog Cannon can be a big money saver. Very high evaporation rate. Operating cost, depending on the size of the system, power consumption less than 20 KW. Looking for Waste Water Evaporator ?